Flex Your Guns and Shoot Up! Your humble host is back, head cold and all. I apologize ahead of time for that. I am joined by the awesome and chatty, but not in a bad way, Mr. Chris Excess of Terror Troop. The pride of Mexico City and I have got some wonderful selections for you this time around that will stimulate the senses! First, Dr. West is back and he is shaking up the prison system in Beyond Re-Animator! 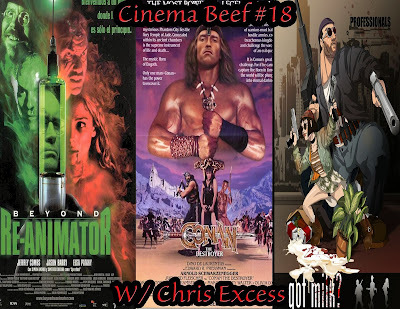 Next, Conan is back with a brand new set of commandos to find treasure and to punch animals in Conan the Destroyer! Finally, Chris and I have a love fest for Luc Besson when we discuss houseplants, guns and the how milk can make you the best assassin ever in Leon: The Professional! 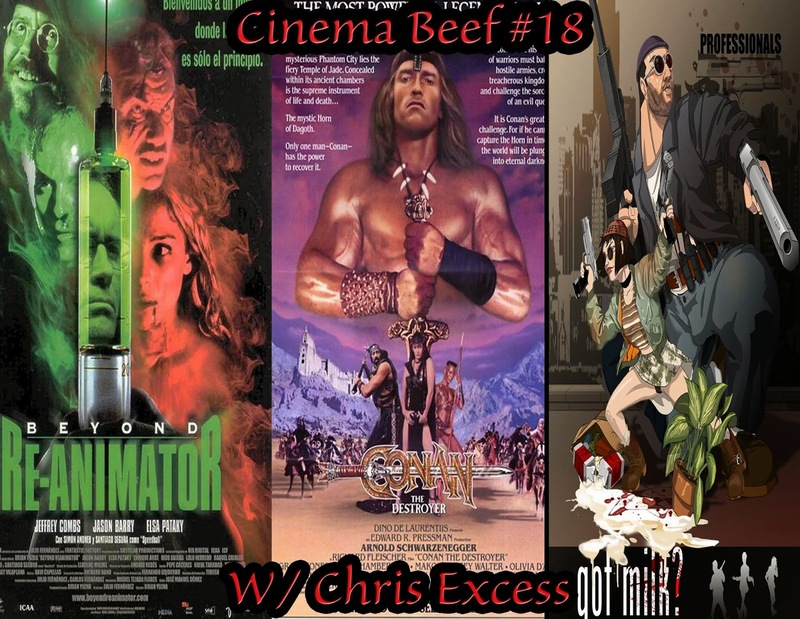 On this episode, I also announce Cinema Beef’s first giveaway! Thanks for all the love, support and patience. Shoot me a voice mail and say hello. It would be great to hear from you! Call me at 708 740-0045! Show us some love and give us a rating on iTunes and Stitcher! Find this show and lots of other great ones on the brand new League of Extraordinary Podcasts! What th Hell Did Moe Make Me Watch?! in Scum of the Earth! I can say 2 out of 3 of these are must sees. Listen to find out which ones! 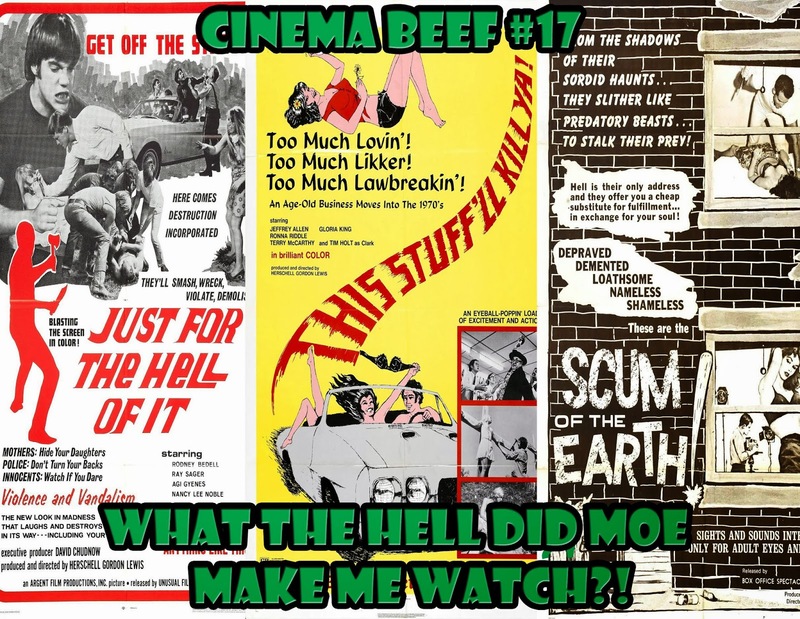 Join the Cinema Beef group! Give Sausagefest Reviews a try. All meat, no kraut! E-mail me with show suggestions, feedback and requests to be guests on the show. Join the No Budget Nightmares group. Check out the Drunk on VHS podcast. Check out No Budget Nightmares with Moe and Doug. "White Lightning" performed by George Jones from the album "White Lightning and Other Favorites"
"Violent Mood Swings (Thread Mix)" performed by Stabbing Westward from the album "Clerks OST"
"There She Goes Again" performed by The Velvet Underground from the album "The Velvet Underground and Nico"
Have a ball in rock and roll heaven! Remember the days when films had those songs that would come up when the characters were either working out or doing a project of just trying to real some insurmountable goal? Do you remember those often cheesy end of film songs? Then, this is the playlist to feed your appetite! This is 20 tracks that I hope will keep you unnecessarily motivated for at least an hour and 40 minutes. Then, you're on your own. Or just start it all over again! Here is the track listing! "Stand On Your Own" performed by Joe Toronto from the film "No Retreat, No Surrender"
"Never" performed by Moving Pictures from the film "Footloose"
T These songs are almost guaranteed to stay in your head so you're welcome! 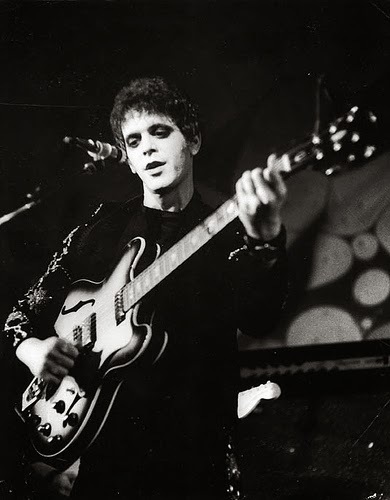 Hope you have a great time going down that long strange trip down memory lane. Thanks for listening. Here it is folks! One month in the works! 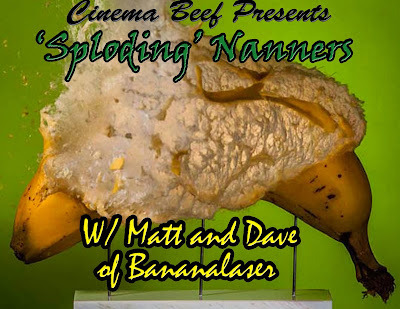 It's the Cinema Beef/Bananalaser crossover episode! It's so jam-packed with controversy that it had to broken up in three parts! We let go of some of our deepest obsessions in pop culture in this our Guilty Pleasures episode! 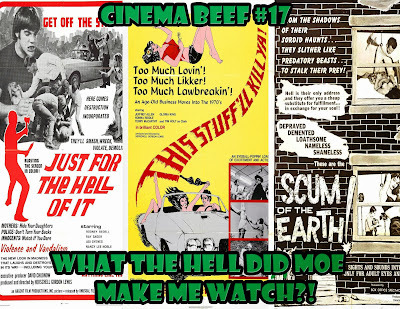 You'll hear outrageous thoughts on what we like from television, film and music that might make us lose some street cred. Also, you get to hear 11 of the finest podcasters that I have the pleasure of knowing get ambushed with 4 questionable questions each in a segment called Confessions of a Podcaster! Their answers may surprise you! Hope you all enjoy! 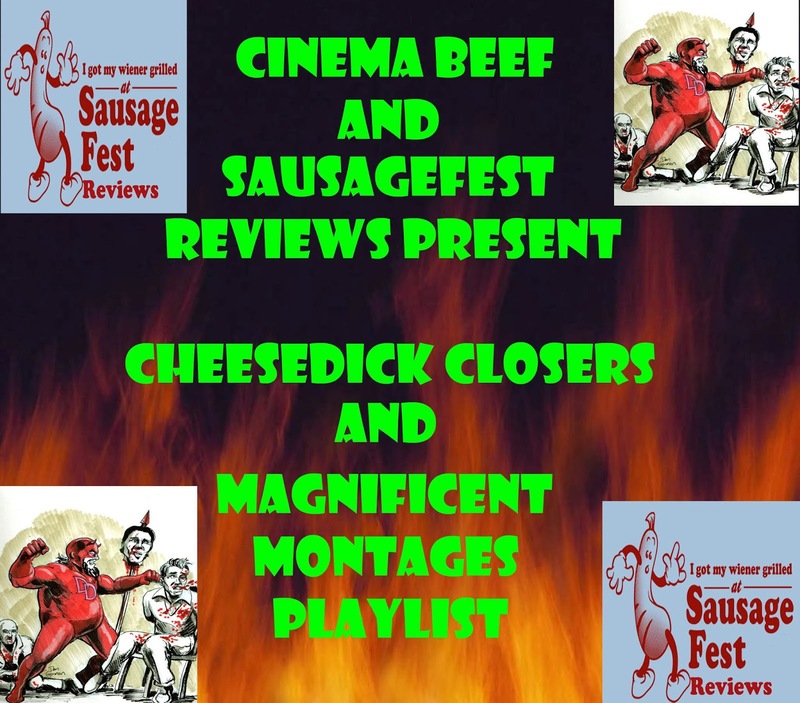 Check out Willis and I on Sausagefest Reviews! Join the Bananalaser Facebook group! 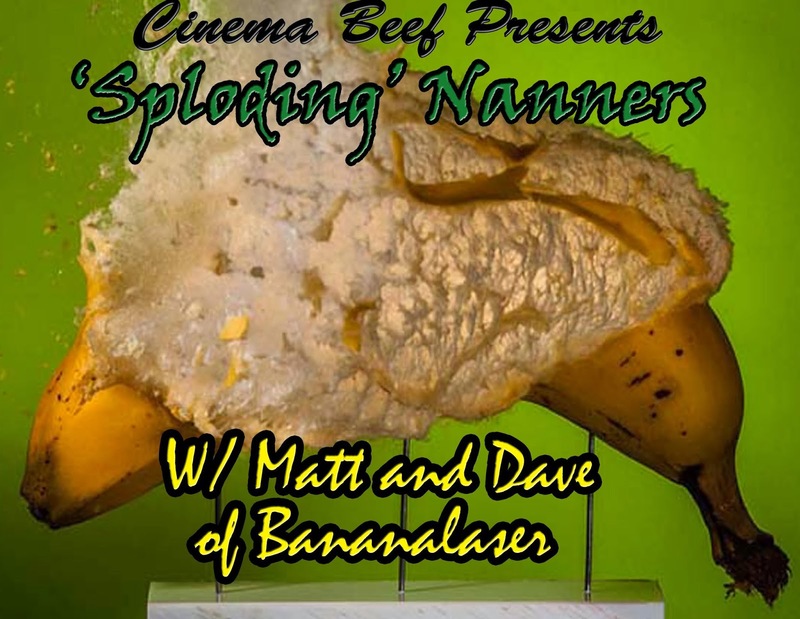 Get Bananalaser and tons of other great shows on the Horrorphilia Network of Podcasting! E-mail Matt and Dave here.